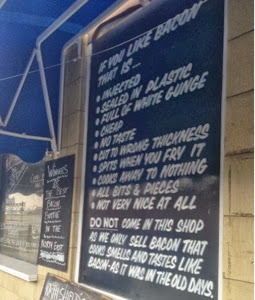 As a self confessed foodie I am embarrassed to admit I have never paid North Shields fish quay a visit. It has always been on our never-ending list of things to do but just something we have never got around to. This weekend we decided to change that. 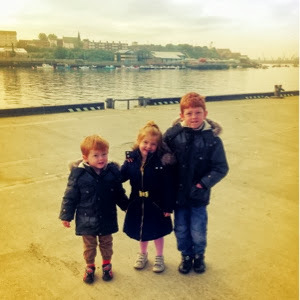 Parking on the fish quay is plentiful and free and our morning started with a lovely walk along the banks of the Tyne. Our toddler enjoyed looking at the boats, our 7 year old enjoyed peeping inside the various fishmongers and reading what they had for sale that day (he was especially impressed that one of them was selling shark) and our 4 year old enjoyed skipping along in the fresh air. 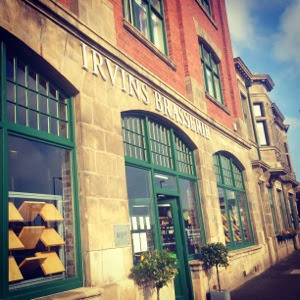 We were booked to enjoy breakfast at Irvin's brasserie at 10am and were all really looking forward to it. Situated in a grade II listed building on the banks of the Tyne, the setting is stunning. 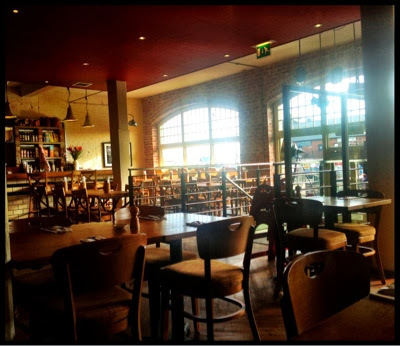 Inside is light and airy and had a lovely relaxed informal atmosphere. Families are welcomed and well catered for. Staff were very friendly and highchairs are available. We picked a table near the open kitchen and our children loved being able to watch and hear our breakfast's being prepared. It was great to see owner and founder Graeme Cutthell on site and getting stuck into cooking as well. Graeme has cooked for many celebrities such as Kylie and Mick Jagger and he used to be Andrew Lloyd Webber's personal chef! 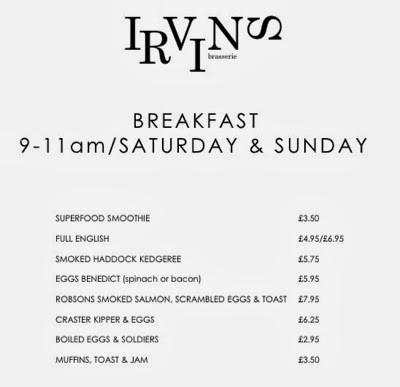 The menu at Irvin's features many locally sourced items such as Craster kippers and Robson's smoked salmon which is fantastic to see. We ordered our food and our drinks arrived promptly. My black coffee was superb and one of the best I have had and hubby loved how his tea was made with proper leaves in a quirky pot. All of our food was cooked and freshly prepared on ordering. 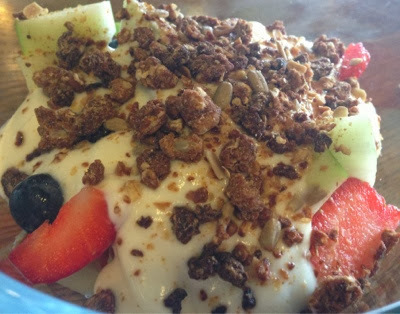 I opted for the fruit salad with vanilla yoghurt and honey granola. It was absolutely delicious and perfect for those wanting a lighter breakfast. 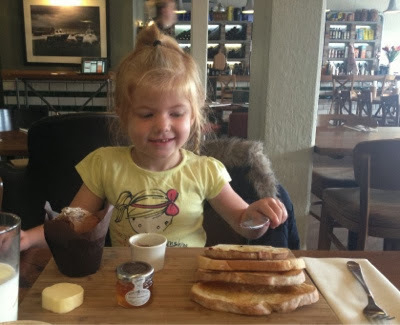 Our two youngest ordered muffin, toast and jam and we were super impressed with the amount and quality of food they received. I especially liked how their breakfast muffins were still warm. Little touches like this are what make the difference. 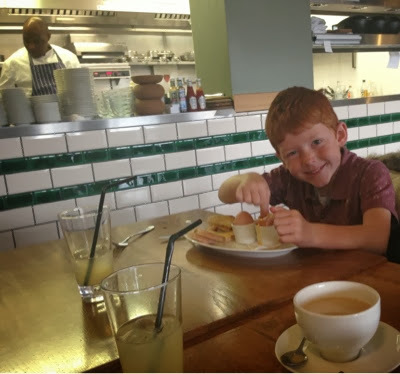 Our 7 year old was pleased that his favourite breakfast dish was on the menu and ordered boiled eggs and soldiers which at only £2.95 is a complete bargain. He thoroughly enjoyed it. Finally my husband ordered a small Full English. He was really impressed with the quality and especially enjoyed the black pudding. We are pleased to report that his poached egg was perfectly cooked. Something that is hard to find! We could absolutely not fault Irvin's brasserie. Service was attentive, friendly but un-obtrusive, the ambience was relaxed and the surroundings were beautiful. 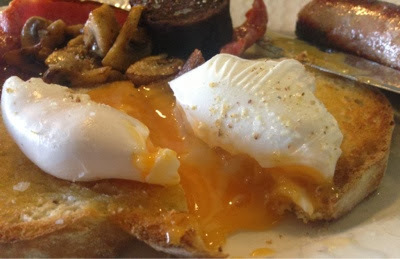 The food was the star of the show though and I think it is probably the best breakfast we have ever enjoyed as a family. 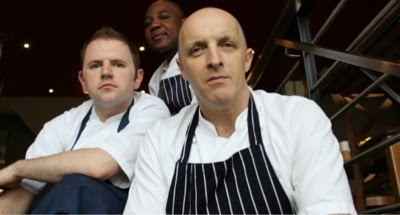 We will definitely be returning very soon and cannot wait to try out their lunch menu. Disclaimer:- Our meal was complimentary however as always our views are un-biased.